TEN’s brand, seriously in the spotlight. A war of words has broken out between Network TEN and its former sales chief Mike Morrison after Morrison said TEN had lost the faith of the public. Morrison told Mumbrella: “There has been a shift in the TV industry in Australia, and now we see Seven and Nine with a duopoly position in the market. 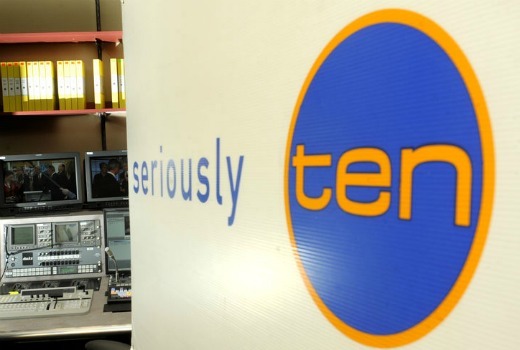 “There came a point where the Australian public no longer trusted TEN, and TEN is now competing with subscription TV channels. “TEN’s relationship with the Australian public has fundamentally shifted,” he added. His words come in a week when 7:30pm shows MasterChef sank to 411,000 and Glee was just 269,000. But a TEN spokesperson hit back, saying: “Obviously, the views and opinions of a former TEN employee are not objective or up to date. It’s worth noting that Mike Morrison was only at Network TEN for five months, and he has not worked here for more than eight months. “We don’t know the context in which Mike Morrison made his comments. But to say TEN has “lost the trust of the Australian public” is absolute nonsense. Trust is a powerful thing in television. It can make or break a network. And it can make or break a show. It may also be the reason that 1.13 million people watched The Last Resort, which has already been axed in the US, and only 792,000 watched Mr and Mrs Murder, which is an original Australian drama. The difference is that the former is on the Seven Network, whose schedule is enjoying the halo effect of My Kitchen Rules, and the latter is on TEN which is struggling to recover from its worst ratings performance in memory. In the TV Tonight Awards readers sent some clear messages to the network by slamming the network for mis-management and programming decisions, but still holding the faith for key shows and personalities such as Offspring, The Project, Homeland and The Living Room. Current ratings show the audience is still sending the network clear messages. Moves such as the hiring of Paul Henry and Andrew Bolt were departures from the traditional TEN audience. Attempting to re-structure the network with its George Negus-led News and send the youth audience to ELEVEN was a misfire. The axing of The Circle was not easily forgotten while programming flops The Shire, I Will Survive and Everybody Dance Now hit rock bottom. You don’t need to be a former sales chief to know that TEN’s brand has been in freefall and that spin doctors are earning their keep to stop the shares (both network and financial) from tumbling any further. Against My Kitchen Rules TEN will languish. After Easter Offspring and The Biggest Loser will return. But then there’s another show called The Voice to contend with. Ten you have a lot of followers who have lost faith in you. You seemed to pick some of the worst television shows to air. The titles to some of them should have been a clue. Of course if Channel 10 had The Voice or Idol then the boot would be on the other foot. While these shows continue to air, not too many are going to be able to beat them. I am glad that NCIS is still somewhere up there for them and above most of the other American crime dramas. There does seem to be some improvement in their overall consolidated weekly ratings. “Seek” had 1.440 Mil viewers & “Berlin” had 1.326 Mil viewers. I think Channel 10 keeping them consistently on Tuesday nights is paying off. There is pretty much nothing of interest on Thursday/Friday nights on any channel, I wish the music shows would be on then, leaving the first half of the week to the other shows. Kerry Stokes has been buying Ten shares. He can see a situation where the only commercial players left are Nine Ent. and Seven West, who both may end up gobbling up Ten’s network assets (One/Eleven/Ten) in the not too distant future under new regulations. There’s been a lot of talk in recent months about this situation. Yes I referenced this the other week, thanks. @SS I wasn’t a fan of the show, but in the first few weeks before the Olympics the shire was over a million with +7. Mr and Mrs won’t hold and will slide too, I think we’ll below the shire. All I’m saying is people have selective memories. @james23 – puhlease! Mr and Mrs M got 782k on Wed and will likely pick up another 200k in the +7s. The Shire was getting less than a third of that. You’re obviously using the expression “ran rings around” differently from everyone else. @carolemorrissey – the ratings stats methodology has been covered here numerous times, I’m not going to re-iterate it. If you think it’s bogus, get yourself a degree in mathematics and devise a new method. While you’re at it, perhaps you could also invent the magic boxes that will report back to Big Brother what we watch on TV and organise their installation, build the routing infrastructure to handle the massage data transfer, design the database to manage the gigabytes of data every single day, and raise the billions of dollars to pay for it all. Kerry reigned in a vastly different era, as do those who only have very selective memories. Not going into the pro’s and con’s of OZ TAM’s boxes, and the number of them etc. but asking all those claiming the boxes do not reflect the correct statistics etc. Does that mean if a show or series rates well for Ten, should those ratings also be taken with a grain salt, because of your claims of inaccuracies, does that mean Big Brother, All Master Chef Series( excepting MCP because OZ TAM has got it So Wrong), Puberty Blues, NCIS, The Good Wife and who can forget the Illustrious and charming Paul Henry’s ‘Breakfast’, who was actually a ratings winner, its just that OZ TAM got it wrong again. Hmmm I wonder if someone knew something about a certain Ch10 CEO taking his marching orders today?? While I am annoyed at ch 10 for how they have treated certain shows, such as White Collar & Blue Bloods, I’m not going to not watch a show just because it’s on channel 10 if I like it. That would be childish and silly. I don’t worry about what network it is on, if I like the sound of a show, I will watch it to see what it is like. I’m always amazed that shows that are huge hits in the US, like Hawaii 5-0, The Good Wife & White Collar don’t rate that well here. These OZ Tam boxes are totally inaccurate, since not every single household with a TV has one. Surely in this digital age & the way technology is, you would think they could find a system to tell what every household that owns a TV is watching. And include taping and watching back later and watching on line. With so many extra channels, there is always going to be more than one show on at the same time that you want to watch, so you have to tape the other ones, not to mention shows that are on too late. My machine is in constant use. And why is everyone pushing for the youth demos…most young folk I know…are either out and about…and when home…DVD’s and computer games….maybe that is the problem?! ?